Cervical spinal stenosis is a narrowing of the spinal canal in the neck, mostly in adults 50 years and older, and can cause pain and other problems. This can lead to squeezing or compressing of the nerve roots where they leave the spinal cord or it can damage the spinal cord itself. These conditions are referred to as radiculopathy and cervical spinal myelopathy respectively. 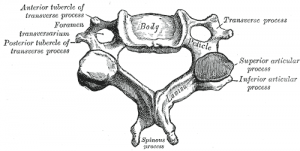 Spinal stenosis occurs most commonly in either the lumbar or cervical regions of the spine. Abnormalities that can lead to stenosis are twice as likely to be seen on an MRI in patients over the age of 40; however, even when such abnormalities exist stenosis may present without any signs or symptoms. In fact research has shown that degenerative changes that manifest in images or scans of the cervical region do not correlate to neck pain. Primary: congenitally smaller than normal canal. Not very common, but usually leads to spinal stenosis in the middle of life. Acquired: result of disease or injury to the spine such as the causes listed below. Age related changes, which include: chronic degeneration, excessive growth of the bones such as osteophytes, destruction of the cartilage, and bulging of the disc. Thickening of ligaments that connect the bones. Congenital factors such as craniodiaphyseal dysplasia, achondroplasia, and Paget’s disease of the bone. Spinal injuries causing dislocations or fractures. A complete exam including medical history and a neurological screen is essential to determine whether neurological findings exist (either myelopathy or radiculopathy) and whether surgery or other conservative intervention is indicated. Spinal stenosis can only be diagnosed with imaging, and MRI is the preferred imaging technique. The video below shows how to read an MRI of cervical stenosis. Cervical myelopathy is the most common problem that occurs as a result of spinal stenosis. The neurological symptoms associated with this pathology are usually the primary impetus for patients to seek care. Cervical lesions narrowing the spinal canal and affecting the spinal cord do not necessarily call for surgical treatment. In fact, 26% of asymptomatic older patients have cervical lesions affecting the spinal cord detectable by MRI. If cervical spinal myelopathy (CSM) or radiculopathy do exist, treatment options are either a conservative approach or surgery. Conservative treatment options for CSM include: immobilization with a cervical collar, NSAIDS and/or muscle relaxants, traction, cervicothoracic stabilization (strengthening of nuchal, upper quadrant, and scapula musculature), and avoidance of activities that cause stress to the cervical spine. Surgery may prevent the progression of myelopathy and improve the neurological deficits. There are many surgery options to consider based on patient presentation and severity. However, not enough prospective randomized trials have been done to demonstrate an absolute advantage or disadvantage of surgery. To date, only poor quality evidence has been produced supporting the effectiveness of a surgical approach to relieve specific nerve impingement. The goal of surgery is to decompress the spinal cord by removing any space occupying lesions, such as osteophytes or disk protrusions, and neutralize any instability. Minimally invasive surgery is becoming more advanced and offers many benefits over open surgery. The video below gives an insight into this. The cervical surgery for stenosis is similar to the outlined lumbar surgery. By clearing out the disk via an anterolateral access, surgeons reach the spinal canal lateral to the neuroforamina through the intervertebral disk space. Once this is done, surgeons can resect vertebral disk protrusions and remove spondylophytes. The procedure decompresses the previously compressed spinal cord. This approach can also include fusion of vertebrae. Generally recommended for anterior space-occupying osteophyte or disc tissue lesions, or if the pathology is mono- or bi-segmental. Intercorporal spondylodesis procedure: surgeons fuse successive vertebral segments of the cervical spine with short bone grafts. Corporectomy: the middle section of the vertebral body is removed in addition to adjoining vertebral discs and then replaced by implantation of either a bone graft or a cage. Monosegmental pathology: surgeons may insert an intervertebral disc prosthesis in order to maintain patients’ mobility and avoid future problems with adjacent segment instability. Advantages of this procedure have yet to be proven. The advantage of the anterior approach is that it can be effective for correcting kyphosis. The disadvantages are that long stretches of ventral osteophytes may have to be removed, risking damage to the spinal cord, and that the risk of fusion failure increases with number of segments treated. The goal is to indirectly decompress the spinal cord. Hypertrophic facets, thickened ligamentum flava, or even anterior space occupying lesions can be removed. Additionally, any instability can be stabilized with hardware or osteosynthesis. Laminectomy: originally the gold standard treatment of multilevel cervical myelopathy, laminectomy alone has fallen out of favour due to documented post-surgery complications. Laminectomy with fusion: With the addition of posterior fusion, this procedure reduces kyphosis and segmental instability caused by removing posterior elements during laminectomy; however, it also leads to altered cervical biomechanics that cause degeneration of adjacent segments. Laminoplasty: This technique aims to preserve motion but with less alteration to the natural biomechanics of the c-spine. The spinal canal is widened by creating “gutters” in the laminae, and then pushing the spinous processes and more involved laminae toward the opposite side. Titanium miniplates are screwed in place to keep this widening open. Originally, laminectomy was highly regarded because of its extensive decompression of the spinal cord, but without fusion, it can result in postoperative kyphotic malposition due to lack of stability in the area. Laminoplasty has the advantages of decreased blood loss, bone loss, less operative time and decreased risk of dura and spinal cord injury, but it is contraindicated for patients with kyphosis and is associated with post-op mechanical neck pain. The MISS technique implies less trauma to the soft tissue and the surgery to be performed in an outpatient setting. Following postoperative time in the outpatient recovery area, patients are discharged home the same day of their surgery. Combination of anterior fusion with posterior approach - the fusion rates are high for this procedure, but the surgery has a high rate of morbidity since it is a more extensive surgery. Post-surgical lumbar and thoracic spine interventions may be applicable to the cervical spine, but more research is needed to validate the effectiveness of these interventions. Although research exists regarding the different surgical approaches for cervical spinal stenosis, there is a lack of agreement about the optimal approach; even more lacking is high quality evidence supporting specific post-surgical physical therapy interventions. ↑ 2.0 2.1 Mayo Clinic Staff. Spinal Stenosis. http://www.mayoclinic.com/health/spinal-stenosis/DS00515/DSECTION=causes. Updated 8 Jul 2010 (accessed 12 Apr 2011). ↑ 3.00 3.01 3.02 3.03 3.04 3.05 3.06 3.07 3.08 3.09 3.10 3.11 Meyer F, Borm W, Thome C. Degenerative cervical spinal stenosis: current strategies in diagnosis and treatment. Dtsch Arztebl Int 2008;105(20):366-72. ↑ Guzman J, Haldeman S, Carroll L, Carragee E, Hurwitz E, Peloso P, Nordin M, et al. Clinical practice implications of the Bone and Joint Decade 2000-2010 Task Force on Neck Pain and Its Associated Disorders: from concepts and findings to recommendations. J Manipulative Physiol Ther 2009;32(2 Suppl):227-43. ↑ Ullrich PF. Cervical Stenosis with myelopathy. http://www.spine-health.com/conditions/spinal-stenosis/cervical-stenosis-myelopathy (accessed 12 Apr 2011). ↑ Kadanka Z, Mares M, Bednarik J, Smrcka V, Krbec M, Chaloupka, Dusek L. Predictive factors for mild forms of spondylotic cervical myelopathy treated conservatively or surgically. Eur J Neurol 2005;12:16-24. ↑ 8.0 8.1 Carragee EJ, Hurwitz EL, Cheng I, Carroll LJ, Nordin M, Guzman J, et al. Treatment of neck pain: injections and surgical interventions: results of the Bone and Joint Decade 2000-2010 Task Force on Neck Pain and Its Associated Disorders. J Manipulative Physiol Ther 2009;32(2 Suppl):176-93. ↑ Corenman DS. Anterior Cervical Decompression and Fusion (ACDF) from www.neckandback.com Available from: http://www.youtube.com/watch?v=yfSkOF_DAfA&amp (accessed 16 Sep 2011). ↑ 11.0 11.1 11.2 11.3 Woods B, Hohl J, Lee J, Donaldson W, Kang J. Laminoplasty versus laminectomy and fusion for multilevel cervical spondylotic myelopathy. Clin Orthop Relat Res 2011;469(3):688-95. ↑ Agrawal D, Sharma BS, Gupta A, Mehta VS. Efficacy and results of expansive laminoplasty in patients with severe cervical myelopathy due to cervical canal stenosis. Neurol India 2004;52(1):54-8. ↑ Luk KD, Kamath V, Avadhani A, Rajasekaran S. Cervical Laminoplasty. Eur Spine J 2010;19:347-8. ↑ Satomi K, Ogawa J, Ishii Y, Hirabayashi K. Short-term complications and long-term results of expansive open-door laminoplasty for cervical stenotic myelopathy. Spine J 2001;1:26-30. ↑ Sinikallio S, Aalto T, Koivumaa-Honkanen H, Airaksinen O, Herno A, Kröger H, et al. Life dissatisfaction is associated with a poorer surgery outcome and depression among lumbar spinal stenosis: a 2 year prospective study. Eur Spine J 2009;18(8):1187-93. ↑ Pastor D. Use of electrical stimulation and exercise to increase muscle strength in a patient after surgery for cervical spondylotic myelopathy. Physiother Theory Pract 2010;26(2):134-42. ↑ McFeely JA, Gracey J. Postoperative exercise programs for lumbar spine decompression surgery: a systematic review of the evidence. Physical Therapy Reviews 2006;11(4):248-62. ↑ Cervical spinal stenosis post surgery exercises. Available from: http://www.youtube.com/watch?v=eOg_Ly-QrpM (accessed 16 Sep 2011).